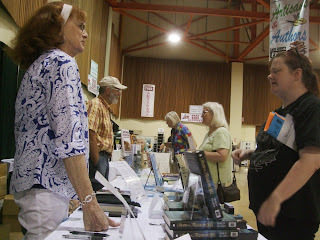 Perhaps I mentioned that I was at the fair yesterday which involved an average of one book sale every two hours. This dreadful business was redeemed by the fact that I spent the hours with other authors. We see each other only at book sales and always have fun comparing stories and catching up. I sat beside the lively Shirley Tallman who always encourages me as a mom, since she is a red-headed Irish Catholic who birthed six children and adopted two, and as a writer, making me feel like I have something to say even though I've written about 1/7 as many books as she. Somehow Shirley has kept her love of life and amazing humor despite the terrible sorrow of losing three of her children, one as an infant, one to cancer, and one to a tragic accident. We were sitting off to the side of a huge room full of displays of the kinds of things that get judged at the county fair. Quilts, decorated cakes, jellies, canned tomatoes, photos, paintings, and much much more. The entries were divided by age--adults' over here and children's over there. We sat close to the adults' food entries, so the signs said "ADULT JELLIES," "ADULT DRIED HERBS," "ADULT CANNED FRUIT" and so on. After about three hours of chatting, not selling books, and staring at jars of food, Shirley suddenly turned to me and said, "What IS it with all this ADULT stuff?? I mean, ADULT DRIED HERBS. What IS that--marijuana??" I told her the entries were divided by age, and the children's entries were in a different part of the building. Shirley said, "My husband says I'm so naive." but instead make me feel normal. After Shirley left we had a couple of hours with only three of us at the tables--me, Bill Sullivan the hiking expert, and Joe Blakely the historian. This is important to know here: Joe is a nice, normal guy who is not flamboyant in any way. He is, I believe, a husband, dad, and grandpa. He meticulously researches his books, such as the ones he wrote on the building of the Oregon Coast Highway, the Tall Firs basketball team, and the old baseball stadium in town. While he is friendly, he isn't overly talkative. Somehow the three of us got to talking about Bigfoot. I turned to Joe and said, "Did you ever see Bigfoot?" And he said, just that quickly, "Well, I saw something. I was driving on a dirt road out toward Alsea, early in the morning, to go plant pine trees on some property I had, and something crossed the road in front of me about 40 yards away. It was not a bear. It strolled like a man, but with much bigger strides than a man. It was hairy, but not as hairy as that old picture that everyone's seen that turned out to be a hoax, and it was more erect. It didn't have clothes on. It wasn't a person and it wasn't a bear." He shrugged. All he knows is what he saw. He doesn't tell the story often because people will think he's a kook. Well, I said, he's definitely not a kook. There really wasn't any more to the story. He didn't stop and look around; he went on to his property and planted trees. The story is what it is. He wouldn't have told it if I hadn't asked. This led to Bill telling a story about a conversation he had with a poet lady who came by to look at his books. I thought it was the sort of conversation that would happen only in Oregon. Poet Lady: You've hiked 20,000 miles of trails in Oregon. Have you seen Bigfoot? Poet Lady: Well, that makes sense. She doesn't reveal herself to just anyone. After my long day of chatting but not selling books I went to buy gas and a lanky young man pumped it for me. "How has your evening gone so far?" he asked, like he wanted to know. I decided to tell him about the disappointing sales at the fair. He was sympathetic. There were other customers, and when he returned to finish up and give me my receipt, he said, "I just had an epiphany! You should have a dunk tank! It was such a hot day, so people would be glad to pay to try to dunk you, and you could have them pay for that, and then give out your books as prizes!" How often do you hear a gas station attendant use the word "epiphany"?? I told him he is overqualified for his job. Yeah, well, but he needs a job and he's hoping to get into the U of O's CAD program this fall. I wished him well and said I'm sure he'll go far. I have met two people whom I think of as Stuck Writers. One is a woman I've known for some time who came to me for advice. 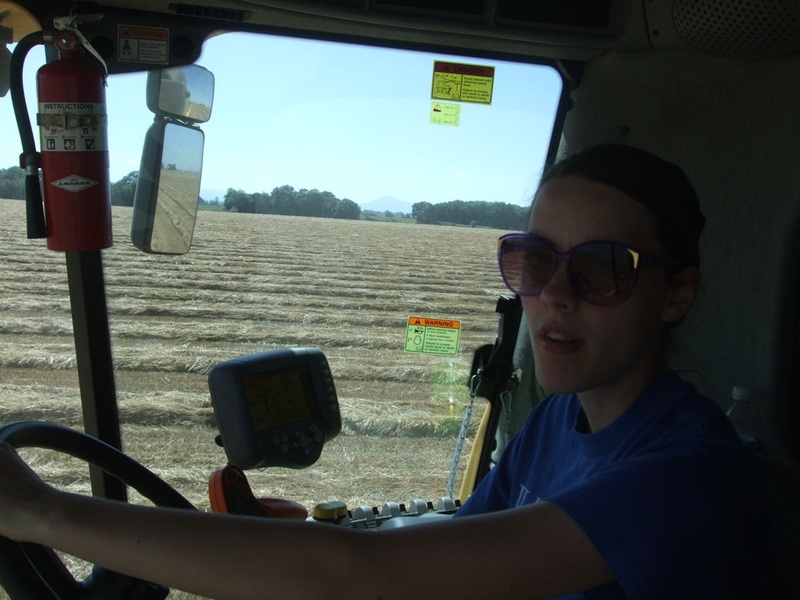 While taking GED classes she found that she enjoyed writing, and her teacher encouraged her. An episode from some time before, when she distinctly felt God's protection on a trip by train, kept coming to her mind. She decided to write it up and offer it to the CLP Sunday school papers. I looked it over, at her request. I suggested a few changes, which she was happy to make. She sent it off with that wild high-risk I-can't-believe-I'm-doing-this feeling of sending off That First Submission. And then of course she waited tensely for a response, imagining the best and worst. The letter came. Her story was rejected. So was she, it seemed, somewhere down deep where the words and the imagination and the hope sprang forth. A solid plug was pushed into that well, and it has never brought forth water since. It has been years. Every time I talk to her, we talk about Writing. She follows my attempts and successes with great interest. I always, ask, hesitantly, "Have you been able to write anything?" And always the answer is no. She cannot get anything out, in any form or way. I always wonder, what would it take to uncork that well and bring the words forth? Yesterday I was at the county fair, as I am every year. I sat there for six hours, dressed for the 97 degrees in a glassy atrium without A/C that I was expecting, and instead we were in another area that was so hyper-A/Ced that I had goose bumps and my asthma went crazy. And I only sold 3 books, so maybe the less said about those six hours, the better. Except I had some fascinating conversations, including one with a fan who came by who turned out to be another Stuck Writer. This lady was obviously an astute reader, analyzing various authors and what she likes or dislikes about each. She dreams at night of plot lines and possible characters. But she doesn't write. Back in high school she rather enjoyed writing. One day her English teacher told them to write a story. She had happened to read a story around that time and thought, "You know what, that just follows a formula. I could do that." So she used the same formula but wrote her own story. The teacher read her story and said it was so good she must have copied it somewhere and she was guilty of plagiarism. The student showed the teacher the original story and told her what she'd done. The teacher finally believed her and said that was perfectly ethical and she had done very well. But something about the trauma of being accused in this way capped her well, and she hasn't written since. She just can't, not even in the privacy of her own notebook, for her own enjoyment. For both of these women, this is far more than "writers block" which is temporary and which many writers say doesn't exist--it's just laziness. This is far deeper. 1. What would it take to get these women to start writing again? 2. Have I, God forbid, by an offhand criticism, ever capped the well for a beginning writer? "You look younger than I thought you would." --several people at the fair. Somehow I never tire of hearing this. It compensated a little bit for the poor sales. Hen: What are you DOING?? 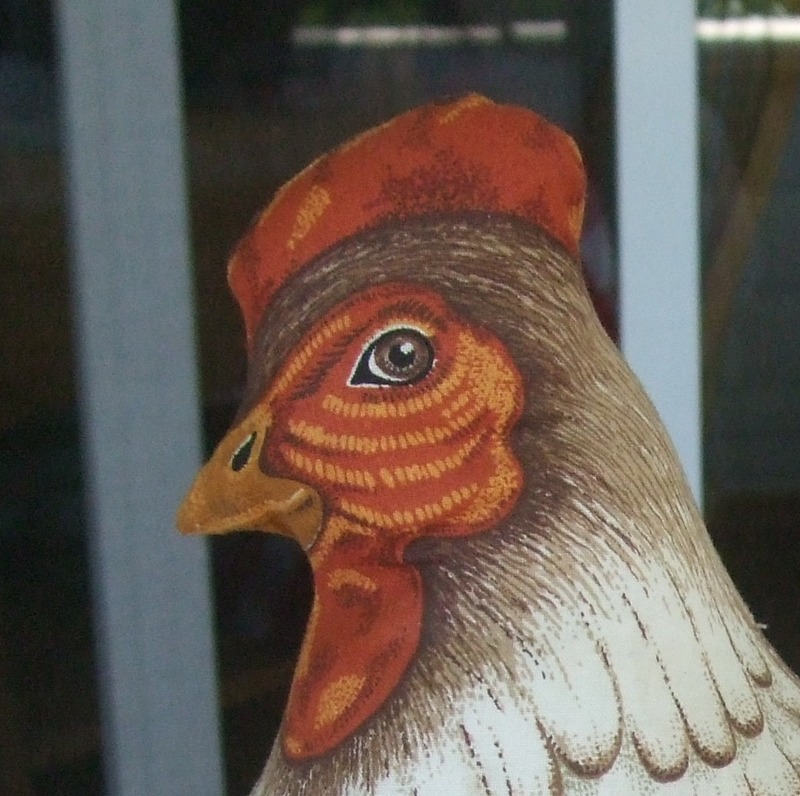 Rooster: I just read this new book by Sheryl Sandberg that says you should lean in. 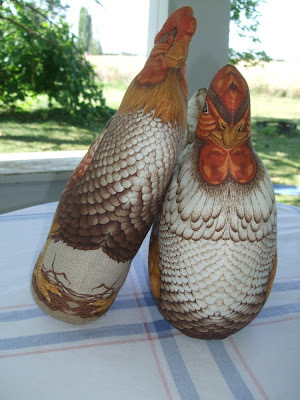 Hen: That's for HENS! Rooster: Oh. Sorry. I'm an antique person and we are moving our milk and egg business out to the old milk house on the farm. We have a retail market room that we have in a dumpy room at the end of our carport but we want to move it out sooner rather than later. I've been collecting ideas and things to use so as soon as we're able, presto, I can put my stuff up. chickens were on my list but I didn't know where to get them. I thought maybe I'd have to pay and arm and leg for large ceramic ones I've seen in catalogs. Wunderbar! She has a niece here in Brownsville. I dropped the chickens off there on Sunday, since the niece is willing to get them to her one way or another. We are all happy, chickens included. Today Shelley the lovely niece was here with her little daughter, Charlotte, and we sat on the porch with Amy and Jenny and talked and had tea. Shelley asked how long I've been blogging and we figured out it's been over eight years. Amy inserted, with a bit of amusement in her eyes, that I've had the same layout and background all those eight years. I said I'm afraid to change it because I have this fear that, if I change it, the whole blog will disappear along with the 1425 posts I've written over the years. Shelley said with a bit of amusement in her eyes that that is something that I could get someone to do for me, if I'm not comfortable doing it myself. See, I'm just doing what all the writer websites say you have to do to succeed in today's market: create a brand and stick with it. Meanwhile, after all my years of hand-wringing both online and off, one of my children has changed his relationship status on Facebook. Ben is dating a lovely young lady named Amanda. And, we already got to meet her. Without Ben being there. In Thailand, of all places. She had flown over to accompany a friend who was going to be working at a different organization in the same city. So first Amanda and I met over iced coffee, and then she went up the mountain with all of us, the time we were warned about the possibility of a king cobra. Amanda and I sat on the round pillows in this lovely little pavilion to sip our iced coffees. We had no trouble filling up the hour with conversation. My cousin's helpful daughter had brought her over on a motorbike, hence the helmet there on the right. Amanda was undaunted by both the king cobra possibility and meeting Ben's family without him being there as a buffer. *i.e. using the Mennonite definition and implication(s) here. "The main lesson in Amelia Bedelia books is that you can get by with anything if you're a good cook." I realized something recently: I always assume that I am not like other Americans and that statistics and averages do not apply to me, but I’m not sure my children have absorbed the same mentality. Maybe it started back in about 8th grade when Mrs. Plut had us do some kind of study of economics and took a raised-hands poll of how many of us owned which items that technically weren’t necessities. TV? Everyone but me raised their hands. Up to this point she was counting the raised hands and writing down the total. She switched gears and said to raise your hand if you DON’T have this item in your home. Sports Equipment? I was the only one raising my hand. She had a very long list. It got to be very awkward and embarrassing for me and Mrs. Plut in particular but also for the others, who giggled either mockingly or sympathetically with each question. When the ordeal was over I was left with a very distinct impression: I am not like normal, average American people. At all. Ever since, I read statistics and assume they don’t apply to me. “The average American eats 22.5 teaspoons of sugar a day." Pffffftt. “The average American wedding cost $28,400 last year.” You have got to be kidding. “The average American family has 1.8 children.” Chuckle. “The average cost of raising a child is $222,360.” Ha ha ha ha ha!!!! “80% of Americans owe more than they own.” Yikes. That’s pretty scary and thankfully we have stayed in that elusive 20%. The “typical” behavior of Americans overseas? God forbid that that applies to us. “The average American reads only five books per year.” Which means our family reads as much as an entire town or at least a large neighborhood. Our son Matt likes to talk about a lot of things, including demographic trends, statistics and girls. He attributes much of the difficulty of finding a good woman to patterns in modern society, such as the high number of women who want a career before marriage, pushing the average age of marriage to 27 for women, and the shocking statistic that 60% of college girls are into hooking up rather than real relationships. Then there’s the fact that 75% of divorces are instigated by women and the statistic of how often men lose their children and a lot of money in a divorce, and you have yet another trend of men avoiding marriage. Except in his case, working in the middle of Washington, D.C., the statistics kind of apply after all, surrounded as he is by young women who are all about careers and obligation-free weekends together rather than commitment, marriage, permanence, children, and so on. It makes me realize what a sheltered life we lead, rural and religious and out of the mainstream. I don’t think we can conclude that no one should leave the farm to go to Paree. I just hope Matt can manage to defy the averages, always swimming upstream, even if it’s much harder to do so in the big city, away from the cultural and geographical setting he grew up in. And of course, I hope he can someday find that one nice female fish who is swimming the same direction and they can raise a nice family with lots of little fishies who buy Goodwill clothes and don’t eat much sugar and read books instead of watching TV. Because in this culture, to raise a child well is automatically to teach him or her to be an exception, even if everyone else in 8th grade laughs. 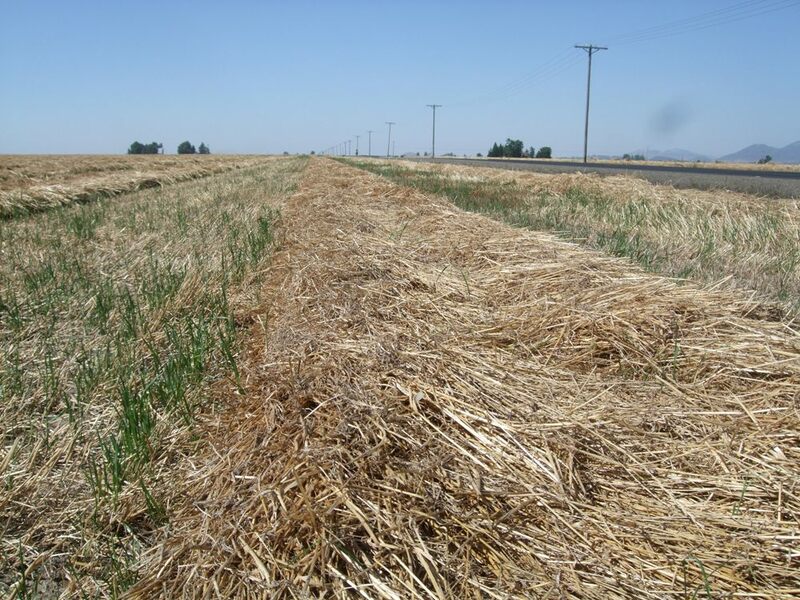 It's grass-seed harvest time in Oregon. 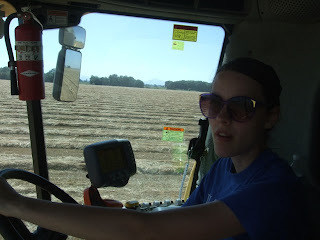 Emily got a job driving combine for a farmer a few miles away. Today I went out and rode with her for a while. 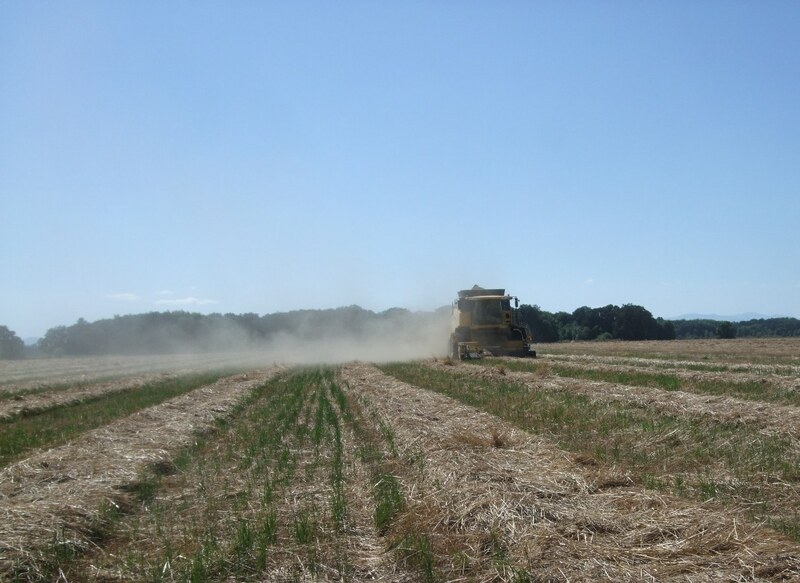 When it comes to farming, we are not in Kansas any more. So to speak. Bear in mind that I used to work out in the fields on a Farmall M with a molded metal seat with holes in it for ventilation, and with very manual gears and clutches that had to be strong-armed into submission and who would snap back and hit a bare ankle occasionally, just for fun. Yes. Well. So here we have our daughter, who gets frustrated with her physical weakness, operating this behemoth, and it obeys her meekly and submissively.Everything is automated, responding to a gentle touch on a lever. Gentle beeps remind her of anything she's forgetting. 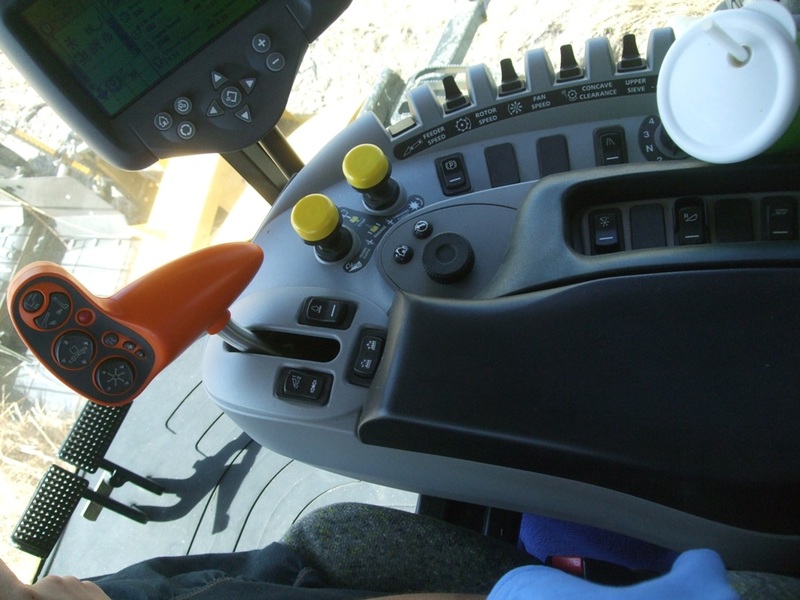 A computer screen shows her speed, pounds per acre, moisture level, and a lot more information that is not useful to her but is to the farmer, I'm sure. 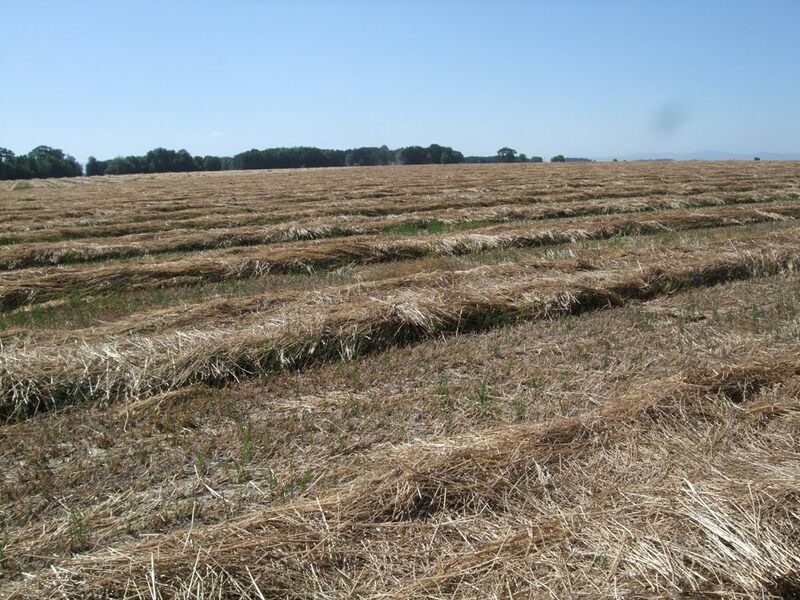 And yet, old-fashioned or modern, farming is farming. 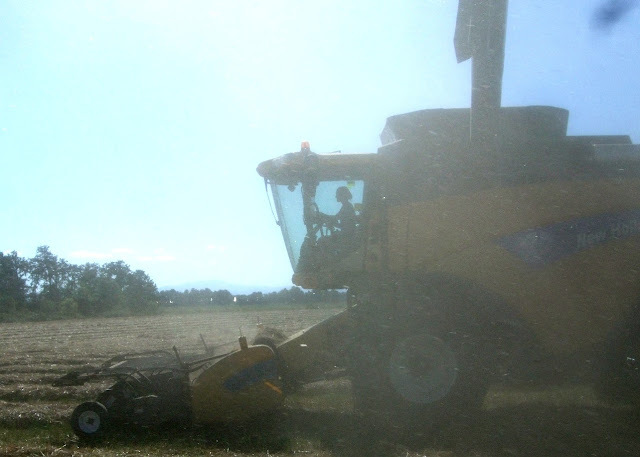 Big fields in the hot sun, anxious farmers, windrows waiting, dust blowing, and the seed falling into the hopper. A phrase from the Bible kept running through my mind, so when I came home I looked it up. Psalm 126:5,6 They that sow in tears shall reap in joy. He that goeth forth and weepeth, bearing precious seed, shall doubtless come again with rejoicing, bringing his sheaves with him. July's Letter from Harrisburg compares the sense of control that Mennonite moms like to have, especially when they travel, vs. how much they actually have. Like when they go to Thailand. I have a whole new level of respect for women like Beth Moore and Sheila Walsh. You know who they are, right? You don't??!! Wow, you must not be an evangelical Christian woman of a certain theological stripe. Ok. Beth Moore is EVERYWHERE. She's an author and speaker who writes and presents these powerful Bible studies. She often presents her material to big crowds of people, and often this is recorded and sold in Christian bookstores and watched by women's Bible study groups or Mennonite ladies on a retreat at the coast. Sheila Walsh is a singer, I think, whose ministry morphed into speaking after some major personal upheaval, and her stuff is also available in recorded form. Now I have been blessed by both of these women, and they have some great insights into Scripture, but I **may** just possibly have imitated Beth Moore's southern accent and intense preaching speaking style in a **slightly** mocking manner, maybe once. But after a few experiences of this week, I am bowing before Beth and Sheila and their ilk and wondering HOW DO YOU DO IT?? Not their amazing Bible studies so much, but their videos. They look poised and polished every second, hair in place and garments never bunching up here or sagging there. They do not use notes or forget what they were going to say. There is no extraneous noise in the background. There are no glitches in the video or audio. The bouquets on the side are always huge and beautiful. There are no bees buzzing around the bouquets. Every sentence they say is clear and concise. Next week there's an event scheduled in the Pennsylvania wilderness somewhere called Passion Camp for Girls. It's for Anabaptist young ladies, and the focus this year is on technology and social media. You should go, if you're a teenage Anabaptist girl. I was asked to attend and to speak on "untechy parents" which is about untechy parents, and "viral faith" which is about using social media for good. Sadly, I had to say no. With Thailand in June, harvest in July, and probably visiting my parents in August, I didn't see my way clear for a trip to Pennsylvania in July. Well, they said, would I consider videotaping two talks and sending them instead, since I was very intrigued with the subjects, and no other potential speakers seemed to be? So we got back from Thailand and I fought jet lag for a week, getting very little sleep at night, which inevitably, for me, leads to getting sick with a cold, which inevitably leads to something like bronchitis or, laryngitis this time, with full-blown unspeakable asthma. I also lost my voice. Finally, down to the wire, we decided to go for it even though I wasn't quite well. But I had enough voice that Steven said I could sing bass in a quartet. Amy got her new camera ready. I prepared a spot on the porch. 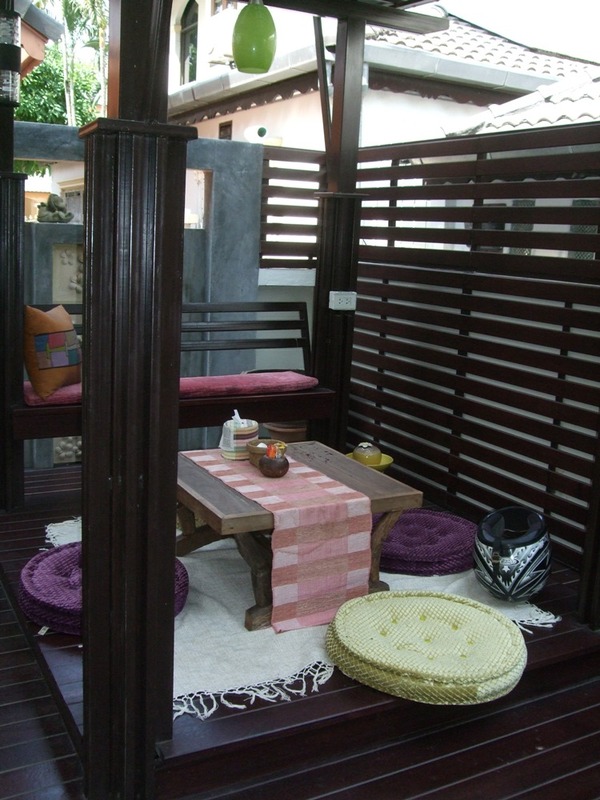 Now I am all about being real, but I was halfway through pressure-washing the porch, and I wasn't ok with anyone seeing a jumble of old wicker furniture or half-dead plants or the cobwebby unwashed sections. So we put the round table in front of a clean section of wall, and put a nice black tablecloth on top. 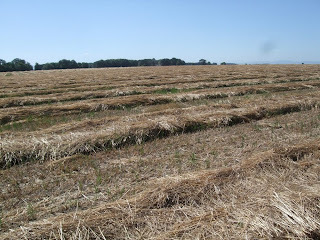 We hauled the wicker out of range to the east and the picnic table and garden hoses out of sight to the west. The girls arranged flowers and Amy set her camera on a box on the porch rail. I brought a teacup and a pot of tea for props and also to keep my voice afloat. Amy pinched the ugly leaves off the bouquet and turned it around for the best angle. Then she clicked the camera, said, "Action!" and walked away. Every couple of minutes I had to pause because a big hay truck was passing. Or a small plane was flying overhead. Or I had a coughing fit. Or the train was going by, honking all the way from Harrisburg to Halsey. I shuffled papers and cleared my throat and the teacup rattled in the saucer when I got emphatic with my gestures, which I tend to do now and then. Hair strands blew into my mouth and the cat walked across my feet. Doors opened and closed. My jacket scootched out of place and I yanked it back. Jenny giggled in the background. Bees buzzed around the camera lens. I had to keep looking at my notes because at my age you can't remember what you just said or what you were going to say next. I scrambled for words at times. I said Um. Combines the size of a county courthouse whined by like they had all day to get to the next field, and big John Deere tractors with windrowers roared by, faster. Amy's camera card held only 15 minutes of material, plus her batteries kept dying. So the recording got choppy. We also recorded a few illustratory skits which involved shoving all of Paul's paperwork mess from around the recliner out of camera range, and shutting the pantry doors to spare people that sight in the background. Finally we finished and Emily earned two stars in her crown in Heaven by spending many hours staring at the computer and editing out the truck-noise pauses and also the coughing, and splicing the rest together into something coherent. Paul said that with the foreshortening in the video it looks like I'm leaning my elbows on a casket. I mailed the DVD's to the camp's sound guy with a sense of relief but also a large sense of humility at their many imperfections. And I am wondering: HOW DO BETH MOORE AND SHEILA WALSH DO IT?? If it was this complicated to record something very imperfect, how in the whole world do they do an hour of slick and polished from start to finish? Last Saturday my mother-in-law, Anne, was at an estate sale. I think her son-in-law's aunt's things were being sold. She called me. The connection was terrible. I heard something about roosters and then we were cut off. Finally I just hollered that yes, I'll take them, since the connection wasn't going to get any better and I think that's what she wanted to hear. 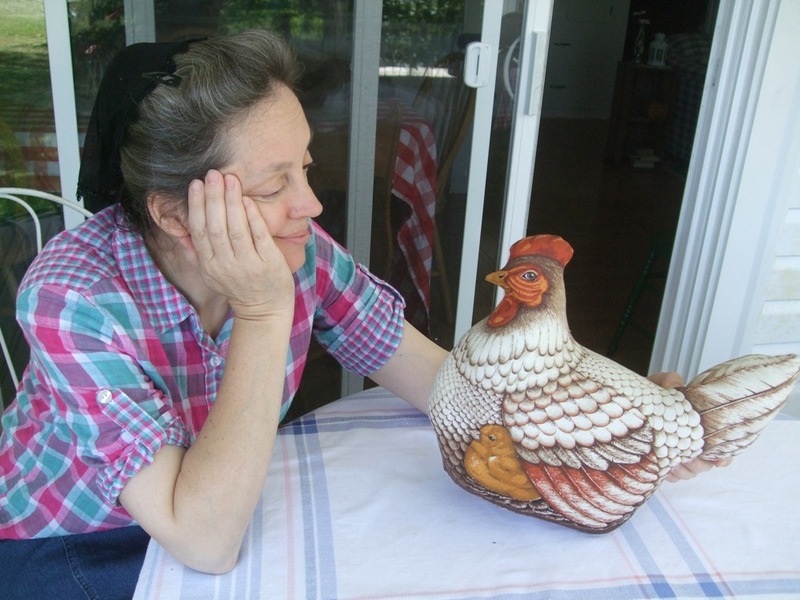 Now Anne remembers things about you, like if you are looking for a meat grinding attachment for a KitchenAid mixer, or if you like Harold Bell Wright books or if, like me, you like hen-and-rooster things in your kitchen. And she really enjoys matching up people and things. 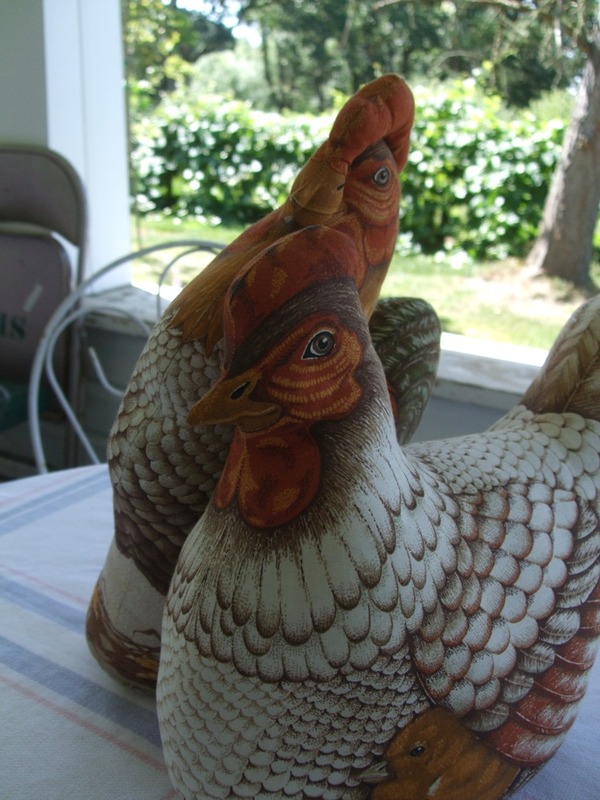 She came for Sunday dinner and brought the roosters that they had given away at the estate sale. Actually, it was two roosters and one hen. They are kind of like pillows, very stiff and stuffed, with cardboard in the base so they stand up. I thought they were cute. However, they are too tall to set on the shelf above my cupboards, and the colors don't really "go" with my kitchen, and they are definitely not comfortable to sit on as kitchen-chair pillows, and there's no good place for them. Which puts me in a terrible dilemma, since my thoughtful mother-in-law chose them for me and they are now mine, and they have eyes and shapes and personality. My daughters didn't want me to keep them. They were all flippant and logical and unfeeling about this. "They don't match, and they don't fit anywhere." As though that decided it. I said, "You just don't understand. Surely I can use them somewhere. Poor Grandma. That was so thoughtful of her." They said, "Mom, you have No Use for them. Grandma would understand." 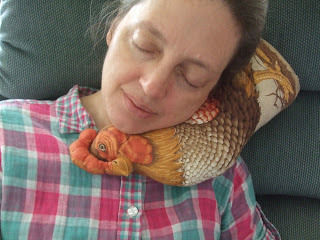 I said, "Hey, I could use them for a neck pillow when I fly!" I demonstrated this useful purpose. Jenny, who is 14 and melting with embarrassment about me every time we go out in public* had emphatic and horrified words and facial expressions about this idea. The older girls said, "Please, Mom, they are ugly." I said, "They are not. That much." They said, "Mom, just GET RID OF THEM." I wailed, "I CAN'T. Look at how that hen is just LOOKING at me with those beady little eyes, like she's saying, 'Ya, Dorcas, I know good and well what you're scheming. Fine! Just throw me in the trash!'" In fact, she looked just like my grandma when she knew we were up to no good, that sharp sideways glance with no smile. My mom, too, for that matter. She even looked Amish. The roosters did too. I said, "Besides, someone put a lot of work into these. Well, quite a bit. Thankfully they were printed pieces and they didn't have to applique all this." Emily said, "It's exactly like Aunt Loraine says. Yoders feel SORRY for THINGS. Especially for abandoned things that nobody else wants. They feel they have to RESCUE this poor STUFF." I had to laugh because that is very true, but there are Yoders who are MUCH worse than me about this, so why couldn't they let me keep these poor chickens that have FEELINGS unlike all the old 3-legged chairs in Dad's barn or the soap Fred rescues from truck-stop shower garbage cans? 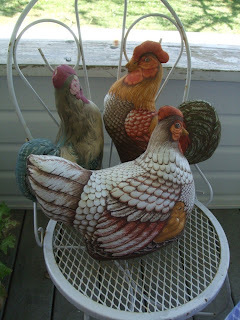 I finally put the chickens on the porch on the tea table. I thought they looked very country and clever. The girls were momentarily pacified, although I sensed we were not finished with the discussion. One night they slept outside and needed extra pillows. The hen looked at me sideways and smiled, just a little bit. Amy, after reading the above draft: Hey did you guys actually use the chickens for extra pillows? Jenny: No. I got them to throw at Emily. Amy: Oops, there goes Mom's blog post. Looks like it's you and me against the world, Henny Penny. *"Mom, I am NOT going garage saling with you if you wear a fanny pack. I just refuse." Ok then. I wanted someone to go with me so I capitulated. Me: You really need to lengthen that skirt so you can sit down with a shred of dignity. Jenny: If dignity is so important, why do you use a fanny-pack? Me: SIGH. Paul, do you think a fanny-pack looks undignified? Paul [treading carefully]: Well, you'll notice that I never wear one. Some people could make my life a lot easier if they just chose to. What is it that makes some people be remembered long after they move out of the area and out of your life? It's summer and harvest time, that glorious brief time of the year that I have written of rapturously many times. This morning I got up at 7 and I had two offsprings in the kitchen, one leaving for work and one coming home. Big trucks full of hay go flying by with bits of hay streaming in their wake. Paul is weary but pleased. Cousin Tristan has set up a pop stand by the bridge. And the air has That Certain Smell. 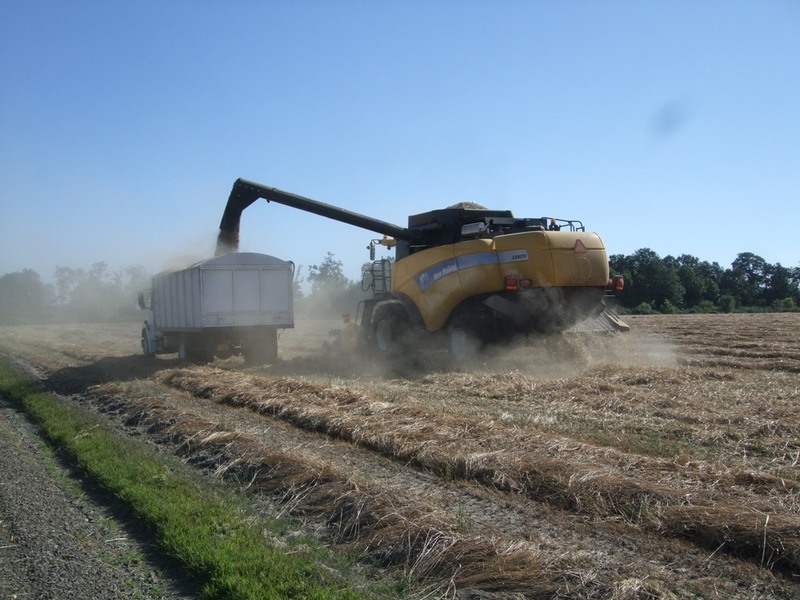 One of the details of harvest is all the summer help. Every year, swarms of young men and women descend on the Valley from all over the country and sometimes out of it. There's "Larry's crew" and "Derstine's crew" and sometimes a nephew at our warehouse and a whole bunch more. Most of these young people put in their time and make some money and memories and are never seen again. Yesterday, when Steven was about to start his first night shift sacking seed, Paul admonished him to do whatever it took to stay awake. And not to fall asleep. Like Travis. Travis was a college friend of our neighbor Leroy's son who came to sack seed for Leroy a few years ago along with his friend whose name I never learned but who went by the nickname of Boulders. Somehow those two, but especially Travis, became the sort of legend about which tales are told. Travis worked nights and slept days, theoretically, but one day Boulders kept bugging him to do stuff with him so Travis didn't sleep much. That night Travis fell asleep on his shift and woke up to find an enormous pile of seed overflowing out of the cleaner-hopper. The forklift was buried underneath. We don't know how Travis responded to this, or Leroy either, except that Travis lived to tell the story and to be a caution for endless Night Guys to come. One night Travis and Boulders were driving somewhere and hit a deer which took out one headlight. Soon after, they hit a shower in the middle of the road and took out the other headlight. Yes. A bathroom shower stall. In the road. So they continued on, driving backwards. Travis was fascinated with the Mennonite culture. He came to our church sometimes and to youth events and asked a thousand questions. He knew nothing of the unwritten rules, and didn't know enough to care. When he went along to youth camp, he asked what would happen if he wore a bandana on his head. "You would get Talked To," he was told. "By 'Sam.'" Ok, every Mennonite young person in the universe knows about That Youth Sponsor who will be chosen to Talk To You, and most young people would like to avoid such a conversation. Travis said, "Cool!" and wore his bandana, and got Talked To, and stopped wearing it, out of happy cooperation and not intimidation. I liked Travis for many reasons but especially because despite his Seattle roots and wide experiences he was inordinately impressed with the fact that I wrote articles for the newspaper, and sat on our couch one night and quizzed me about it, with frank admiration on his face. How can you not like such a guy? Emily says that one night they were coming home from a youth group gathering, Matt and Travis in the front seat; she and Boulders in the back. Boulders pointed out the distant lights on the freeway and actually remarked that they make him think of fairies. Well, anyone who sees headlights and thinks of fairies is Emily's friend. Travis and Matt weren't as fond of fairies. However, all four of them were familiar with a then-new movie about Peter Pan. So they quoted it, for miles, Boulders and Emily chanting, "I DO believe in fairies! I DO!" while Travis and Matt chanted back, "I DON'T believe in fairies! I DON'T!" I am sure this was as bizarre as it sounds. But the truth is that stories are told of all four of those people to this day, when winter nights are cold, so maybe what it takes to become a legend is a knack for plunging yourself into the moment and seeing where it takes you, without worries about being thought odd. I don't know what ever happened to Travis and Boulders. 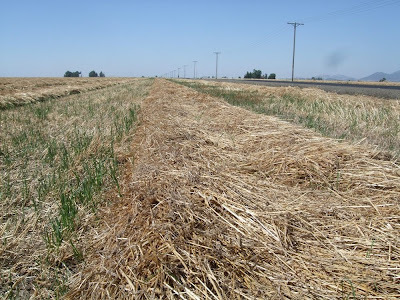 They have probably wandered off to faraway exotic lands where they make friends and have narrow escapes and leave stories behind them like bits of straw streaming in the breeze behind a loaded, speeding hay truck rounding the curves on Powerline Road.